Working super late or have clients coming from out of town? Not a problem! Newly constructed in 2001 and upgraded with a multi-million dollar renovation in 2009 and 2014. The Hilton Garden Inn offers world class service, luxury and convenience. Our hotel is just minutes and a complimentary shuttle away from Newark Liberty International Airport and Downtown Manhattan. 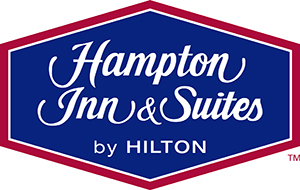 Whether you are hosting a large event or have a client staying the night, great amenities, free hot breakfast, and free highspeed internet access in each guest room are just a few of the highlights of staying at the Hampton Inn & Suites by Hilton. Our beautiful 200 seat restaurant, featuring 2 private dining rooms that can each seat up to 65 guests, serves Breakfast, Lunch and Dinner daily, and Sunday brunch. Our award-winning Modern Italian and American fare, attentive service, and art-filled setting combine to make your dining experience at Lorenzo’s exceptional! Our “Eat Good. Do Good” café not only offers a wide variety of food to fit any preference, but also donates 100% of the net proceeds to charity. This is a great place to grab a good meal with extreme convenience. Serves gourmet breakfast, lunch and dinner. Order online for express pick-up. Free delivery for catering orders for 5 or more. Nicotra’s Ballroom offers 22,000 square feet of versatile meeting / banquet space for your next corporate meeting, conference or forum. Projector screens, audio and video outputs. Other amenities are available. Above features spectacular panoramic views, sophisticated decor and a unique open-air terrace with heated cabanas and fire pits. Above ballroom and Above Rooftop each have 9,600 square feet of modern event space.